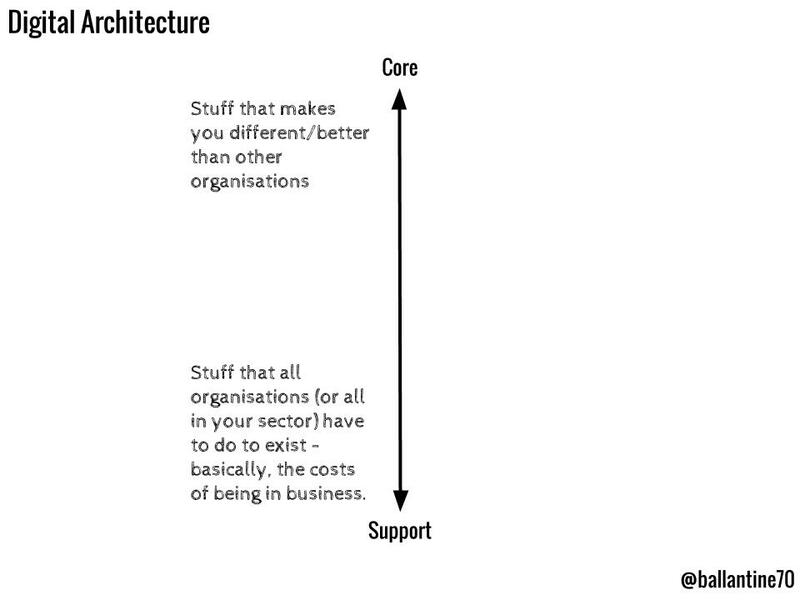 Back at the beginning of 2014 I wrote a handful of articles exploring a simple model for making decisions about where to put effort and investment into things digital that I termed “Digital Architecture”. Nearly two years on, I thought it worth revisiting the technique as I have had quite a number of opportunities now to try it out with clients in many different sectors. First off, it’s really important to stress that this tool is a guide, a technique to facilitate and open up conversations within an organisation. It won’t magically give you all the answers because such magic things don’t exist. Sorry about that. It might help, though. And it’s really quite simple which (from my experience) tends to help. There again some folk like to be bombarded with really complicated stuff that they don’t really understand because they hope that their lack of comprehension will mean that the thing that they are looking at is magic. Such magic things don’t exist. The aim of the digital architecture framework is to work out where you should be putting your Pounds (or Euros, or Dollars). If you are investing Bitcoin, I’d urge you to reconsider my earlier points about magic. For any organisation, there are things that are core activities, and things that are supporting activities that every organisation has to do and don’t offer any differential value. So far, so business school. What you choose to make your core activities is the subjective art of strategic management, and if you want to understand more about that I can heavily recommend “Good Strategy/Bad Strategy” by Richard Rumelt. 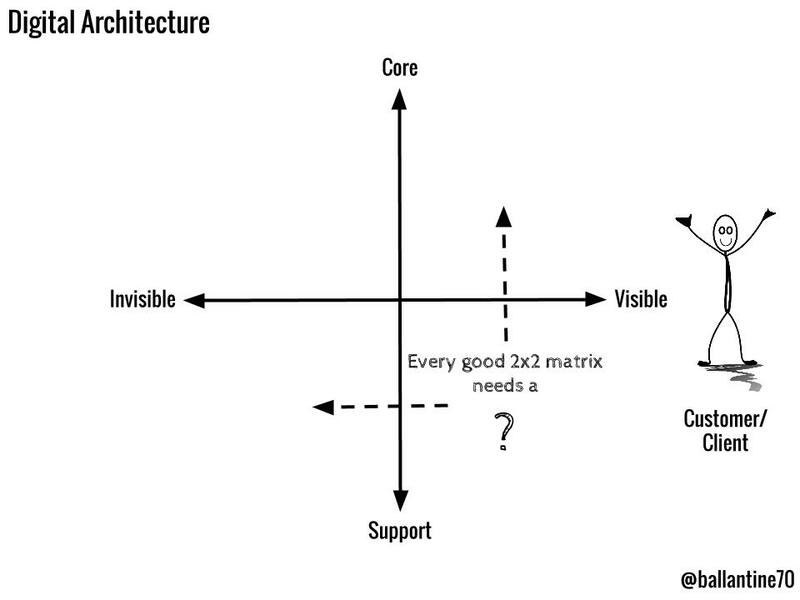 Core or support forms the Y-Axis of a very simple matrix. So far, so business school. 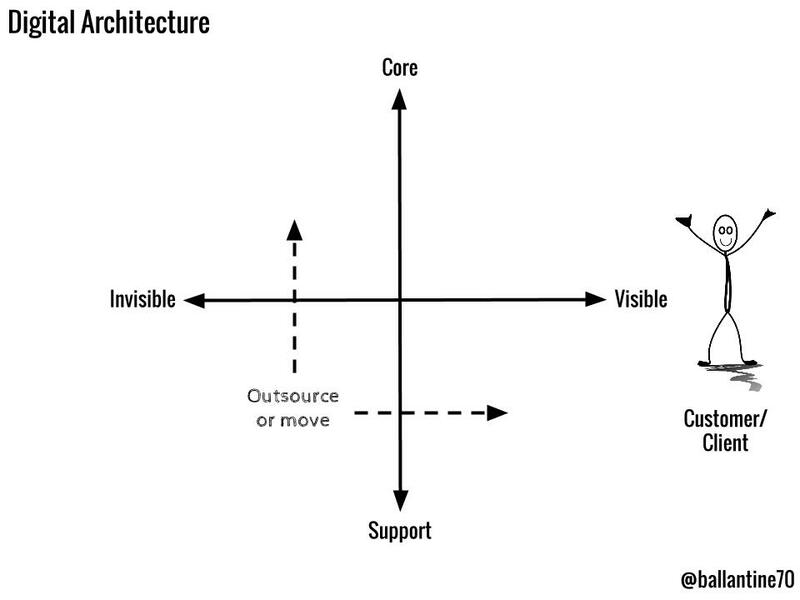 The X-Axis is the extent to which things that you do as an organisation are visible or invisible to your clients and customers. Visibility is important for two reasons: firstly, because things that are visible are more likely to be perceived as valuable (or otherwise) to your clients or customers. 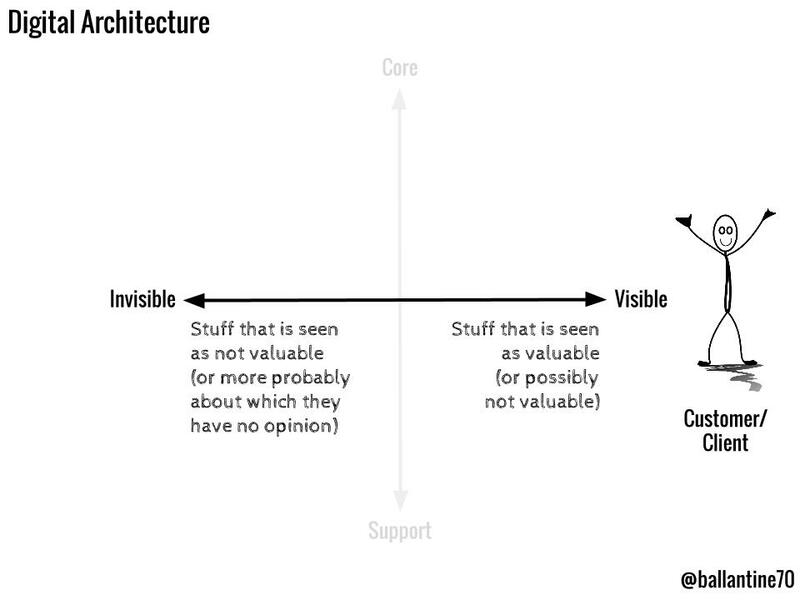 Things that are invisible to your customers are probably just going to be unknown to them. Core business activities about which your customers have no opinion are usually a problem. The second reason visibility is important is because one of the impacts of things going “digital” (whatever the heck that means) is that we as customers and consumers and clients are increasingly expecting visibility of everything that service providers do. Not only do I want to know the time when my parcel will be delivered, but I also want to know the registration plate of the delivery van, the name of the driver, and his inside leg measurement. Now the crucial thing here is to map out activities, not systems or technologies. The things that you do might be done through technology, but this technique works best when you are thinking about the stuff, the outcomes, not the systems or boxes. 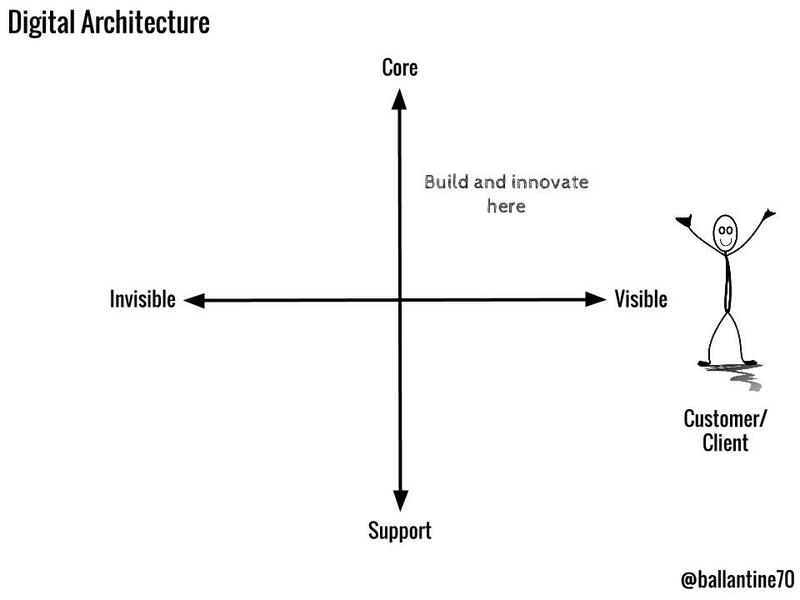 For each of the four boxes, you can now have a discussion about what you should be doing with these things, and the best tactics for technology to enable them.. Let’s start bottom left, with the Invisible/Support quadrant. This box is where you would traditionally look to outsource your technology requirements, if not the activity in its entirety. Should you be putting lots of effort into building bespoke software to run your internal intranet information services? No – use commodity, possibly Cloud, services because investing in unique technology here is going to be a long term liability. Should you run your own Payroll? Probably not. Should you build you own systems to support administrative Finance activities? Not a chance. Having said that, one should always be assessing whether there are any activities in this box that should be becoming core activities, things that can differentiate you from your competition, or allow you to make step changes in the way in which you provide your services. There’s also potential that you’ll need to make such services more visible to clients or customers – financial transaction services, for example. Next up are the Invisible Core activities. The question to ask for services in this box is if, over time, they can be either made visible through technology or if they should be made supporting activities (usually by acquiring software to support them which means you’re adopting industry-wide standard good practices)? If you are already using industry-specific software to support these processes, does that product give you what you need to make that service visible to your customers? If not, should you be moving to a different platform which can make these services visible? For many organisations, a question in this quadrant is often “Are we making any investment here?”. Before the rise of digital, technology investment in organisations was much more concentrated in the bottom left, Invisible Support quadrant. Big ticket items like ERP systems, and IT infrastructure, sucked up all the cash, whilst departments which had a “P” as well as an “L” would avoid investment to maintain profit margins (particularly if technology spend was charged out to departments on the basis of use or project commission. One of the structural challenges for IT in many organisations is fixing the deincentivization of spending in this top right quadrant. Visible Support activities are curious things. A good example? Customer Service. For all that companies talk about customers being at the heart of what they do, many organisations actually treat customer service as a support cost to be managed. With the visibility of modern comms channels (particularly social networks) that’s risky. 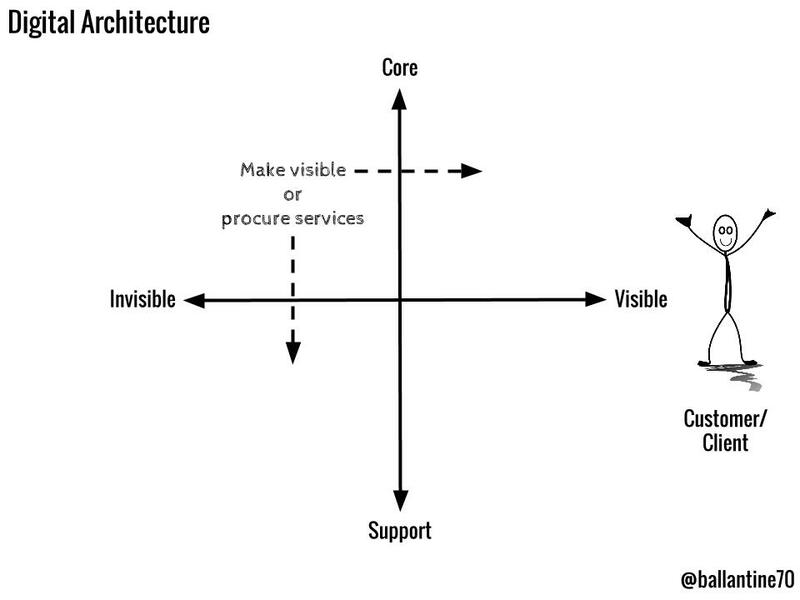 Either you need to try to shift visible support activities into the dark (hard, given the general move to transparency), or bite the bullet and realise that in the digital era the end-to-end customer experience is your differentiator. There are signs that many organisations are waking up to that fact – RyanAir’s increasing customer focus springs to mind.